Amphibians - Animal Wonders Inc. Most people picture a frog when they hear the word amphibian. There are actually three groups of amphibians: newts and salamanders (urodeles), frogs and toads (anurans), and caecilinas (gymnophiones). Amphibians are interesting animals. They spend a good part of their life in or near water but unlike fish, they breathe with lungs instead of gills. Amphibians have to stay close to water because their eggs need to stay wet to survive. Red Eyed Tree Frog (Agalychnis callidryas). Info coming soon. Dumpy Tree Frog or Whites Tree Frog (Litoria caerulea). 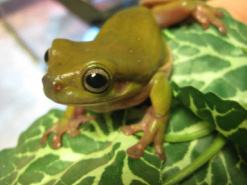 These friendly frogs are found in Australia and New Guinea in warm tropical environments. They are called "dumpy" because when they are full grown they look rather stout with muscular arms a large belly. Dumpy Tree Frogs can change color; when they are in the light they are a brilliant green and when they are in the shade they turn brown. This helps them camouflage and blend in with their surroundings so they can hide from predators. They lay between 2,000 and 3,000 eggs but only a few survive. The tadpoles hatch out and start to grow legs as their tails start to disappear. Dumpy Tree Frogs like to eat insects like crickets, flies, and beetles. They jump forward and grab them with their mouth. Frogs must close their eyes when they swallow. Their eyelids push their eyes back and their eyes help to push the food down their throat. 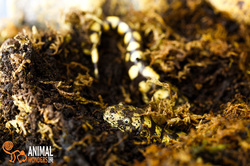 Tiger Salamander (Ambystoma tigirnum). Info coming soon.